Eula Mae Edwards, 81, of Marble Hill died Monday, Nov. 19, 2001, at the Eldercare in Marble Hill. She was born Aug. 14, 1920, at Flat River, Mo., daughter of John Ephriam and Ada Marie Pope Montgomery. 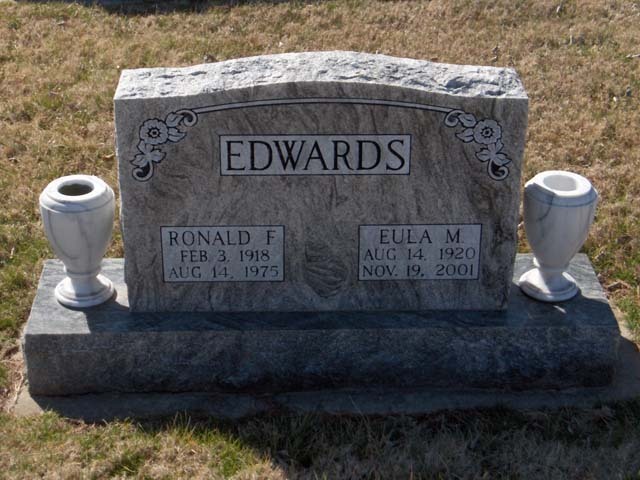 She and Ronald F. Edwards were married Sept. 14, 1940. She attended the Point Pleasant General Baptist Church. Survivors include two daughters, Barbara Ann Houston of Glen Allen, Mo., and Jacqueline Sue Liley of Marble Hill; seven grandchildren; and 16 great-grandchildren. She was preceded in death by her husband, three brothers and a grandchild. Friends may call at Liley Funeral Home in Marble Hill after 9 a.m. today. Funeral will be at 1 p.m. today at the chapel, with the Rev. Gene Robbins officiating. Burial will be in Bollinger County Memorial Park Cemetery.